IDSync® reduces the complexity, improves the precision and reduces the efforts, and the costs associated with the initial provisioning for new employees and the on-going costs and effort required to maintain and support accurate application, password and personal information across hybrid local/cloud application scenarios for existing users. The goal of IDSync® is to solve the problem of user identity management and respond to the cost saving opportunity by delivering on the promise of Active Directory so that it can truly become a single source of identity information for both Cloud and On-premise applications. With the IDSync®’s Active Directory software we’re minimizing the administrative time and effort for our customers making it easier for them to work with Office 365 ecosystem. IDSync® unifies the purchase, provisioning, and management on-premise Active Directory and other Cloud SaaS applications simply and seamlessly without the limitations of AD Connect or similar tools. IDSync® Active Directory integration enables rapid deployment and simplified management but then goes beyond basic directory tool allowing for a variety of deployment scenarios that are commonly encountered by mid-size to large Enterprise customers. These include complex hybrid, or even multi-tenant Active Directory synchronization for various divisions or subsidiaries that might be managed or deployed independently due to security, acquisition, or other real-world scenarios. IDSync® extends the standard Active Directory property pages to provide centralized management for a user’s credentials, meta-data, and application configuration information from a single location, local Microsoft Active Directory, that drives the provisioning and synchronization process. This is accomplished by using the IDSync® Active Directory Connector to manage provisioning and synchronization with other cloud portals and applications including Office 365 and the many 3rd party applications, all directly from the user’s Active Directory, without ever leaving the local environment or making miscellaneous changes in multiple cloud portals thus making it easy to manage user provisioning and changes from the governing, single, secure identity database, Active Directory. Disablement of a user is as easily synchronized as the initial provisioning process and improves overall security by providing a single point of control and management of employee access to cloud application software and privileges. 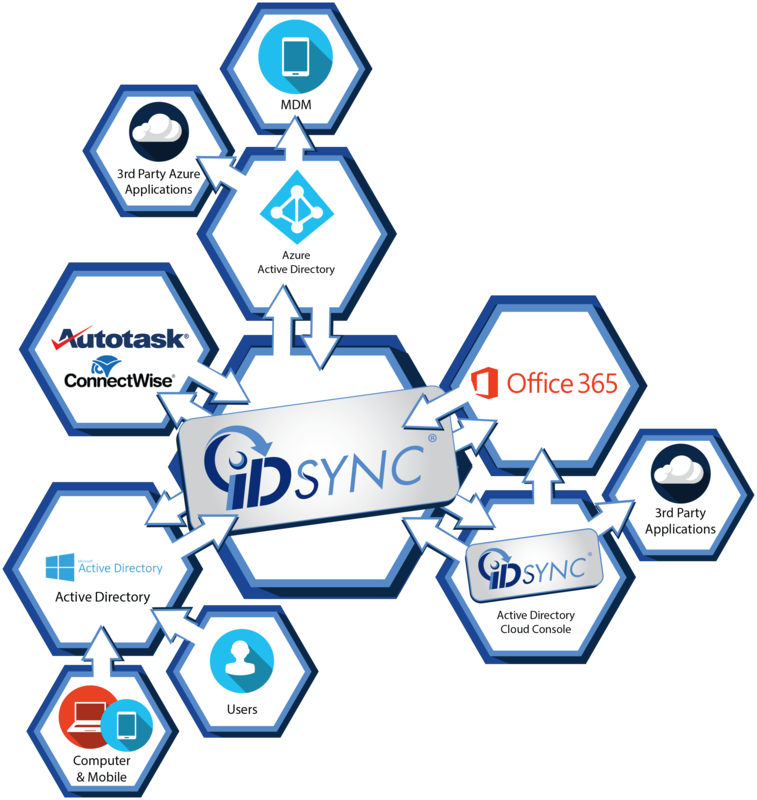 IDSync® updates Office 365 Automation users’ identity records in real-time and seamlessly integrates the standard Active Directory features with Office 365 platform, including support for Windows Security Groups, Contacts, Distribution Lists and more. Single place for customers to administer Office 365 Users, Active Directory without portal(s) logins.